Palestinian prisoner and political leader Khader Adnan has been on hunger strike for 38 days inside Israeli prisons, demanding his release from detention without trial Adnan, 40, a former long-term hunger striker, has drawn widespread Palestinian and international support for his strikes against his detention on various occasions without charge or trial under Israeli administrative detention order. Since he announced his strike, he has been held in isolation and repeatedly transferred, most recently to Jalameh prison. Adnan’s wife, Randa, denounced what she referred to as a “media blackout” on his strike, saying that he has received a legal visit only once and only one visit from the International Committee of the Red Cross since he began his strike. The Red Cross was supposed to visit him again on Monday, 8 October but were told that he was “elsewhere” and the visit postponed. She urged greater solidarity with his hunger strike, which aims not only to demand his own release but to raise the Palestinian prisoners’ struggle to the forefront of the political agenda. In a letter Adnan sent from inside Israeli prisons, he said that “freedom and dignity are more precious than food.” He recounted his latest arrest on 11 December 2017, noting that occupation forces assaulted his wife, two daughters and elderly father, pushing and shoving them. He was handcuffed from behind and blindfolded before being trampled and beaten by rifle butts in the military vehicle. He said that he was taken to interrogation as well as rooms with collaborators in an attempt to extract confessions, but that he refused to give any answers or information. He said that for this reason he was always held without charge or trial under administrative detention or on the basis of others’ confessions under the so-called “Tamir” law, which allows Palestinians to be tried solely based on the confessions of others. Adnan’s letter also emphasized that he does not recognize the occupation or its courts, saying that the individual and collective strikes of the prisoners are a means of seeking freedom and an extension of all of the forms of resistance Palestinians are engaged in outside prison. Adnan’s father also spoke at a protest on Monday, 8 October, calling for his son’s release and standing in solidarity with the women prisoners’ protest against surveillance cameras. He said that the occupation is preventing lawyers and the Red Cross from seeing his son and demanded that official Palestinian Authority spokespeople end their silence on Adnan’s case. Muhammad Allan, another former long-term hunger striker, denounced the PA for its continued security coordination with Israel, even as prisoners face ongoing attacks and violations. Adnan is not the only Palestinian prisoner on hunger strike. Also on strike is Omran al-Khatib, 60, from Jabalya refugee camp in Gaza. He has been striking for 66 days to demand his early release; he has spent 21 years in Israeli jails to date and is suffering from serious health problems. Samidoun Palestinian Prisoner Solidarity Network calls for solidarity with Khader Adnan in his hunger strike. In 2012, Adnan’s 66-day hunger strike inspired protests and mobilizations, solidarity strikes and actions in communities and on campuses around the world. Today, it is just as critical to highlight the struggle of Palestinian prisoners confronting administrative detention – imprisonment without charge or trial – and all prisoners engaged in their resistance behind Israeli bars. The military courts and administrative detention represent the same framework – an arbitrary mechanism for the detention of Palestinian activists and leaders. 1. 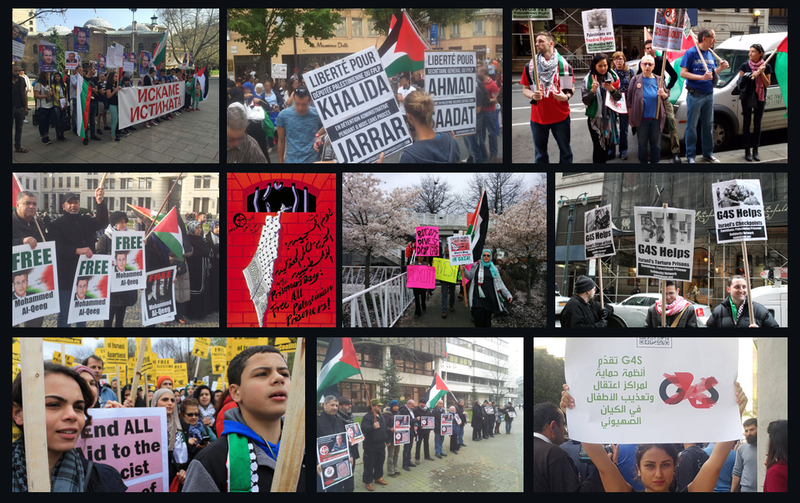 Protest at the Israeli consulate or embassy for Khader Adnan and all Palestinian prisoners.Bring posters and flyers about administrative detention and Palestinian hunger strikers and hold a protest, or join a protest with this important information. Hold a community event or discussion, or include this case in your next event about Palestine and social justice. 2. Boycott, Divest and Sanction. Hold Israel accountable for its violations of international law. Don’t buy Israeli goods, and campaign to end investments in corporations that profit from the occupation. Learn more at bdsmovement.net.